The core mission of WPZ is to provide economic policy advice based on rigorous empirical evidence and cutting edge theoretical research. To promote the knowledge transfer from the frontier of academic research to policy advice, we invite leading academics from international elite universities to summarize policy relevant insights of their empirical and theoretical research agenda. When approaching the knowledge frontier, an economy’s capacity to innovate must shift from imitation and differentiation towards more radical and more risky innovations that aim at entirely new products and services. 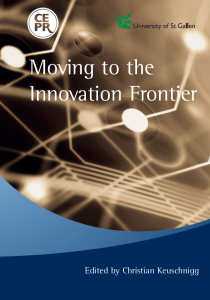 To explore the policy consequences, the eBook „Moving to the Innovation Frontier“, edited by Christian Keuschnigg for the Centre for Economic Policy Research, London, collects the first five essays of the series WPZ Research Frontier and is available here. Innovation by creative destruction causes structural change. Banks and capital markets must reallocate credit and risk capital from firms with low profitability and downsizing sectors to fast growing innovative companies in expanding industries. Find more information including a Video on the scientific workshop organized jointly with CEPR here. The Keynote Lectures are documented in the WPZ series Research Frontier no. 6, 8 and 9, and are published in the special issue of the Swiss Journal of Economics and Statistics, available here. VoxEU is the leading European platform for research based policy contributions. With our contributions to VoxEU we present our own basic research and reach out to the European wide policy community. Only strong banks can fulfil their Schumpeterian role by efficiently reallocating credit from declining to expanding firms. An efficient banking sector thereby magnifies the gains from trade liberalisation by easing the process of capital reallocation. The impact of corporate taxation is up to 70% higher for entrepreneurial firms than for managerial ones. Policy should provide targeted tax relief to the most constrained firms, where taxes are most harmful, if other policies are unsuccessful in improving access to external funds. Innovation drives growth, determines the competitive position of firms, and leads to factor reallocation. Firms must implement more risky innovations as the economy approaches the technological frontier. Priority should be given to research, selection of firms, and reducing frictions.